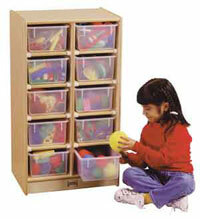 The 10 Tray Mobile Storage unit by Jonti-Craft is ideal for small classrooms or limited space. Choose between models that come with colored or clear plastic trays or without any trays. Standard back is hardboard material, but solid plywood backs are available for an upcharge. Caster mounted. Overall dimensions 20"W x 15"D x 35-1/2"H.